This summer beat the heat with the Kunstocom Air Cooler kunstochill DX-Remote. With a 50 litre water tank, you do not need to fill this cooler every now and then. It ensures air delivery of 4250 m3/hr/2500 cfm that is enough to cool a large room quickly. Withthermally re-engineered seamless corrosion free ABS body, you can use this air cooler for a long period of time. The ice chamber allows you to place ice on it for additional cooling to save you during those unbearably hot days. Since the rear cover can be opened, you can easily clean it from time to time. The front wheels can be easily locked which ensures that it remains stable no matter where you place it. 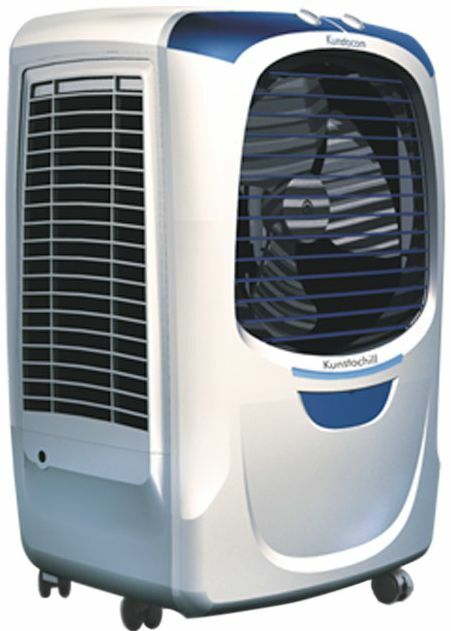 The Kunstocom Air Cooler kunstochill DX-Remote features a pine woodwool/honeycomb technology for better cooling. To top it all, the mosquito net of this cooler ensures that the mosquitoes and other insects do not find it to be a fertile ground for breeding. This is one of the best selling Air Cooler. Buy now and get great discounts and offers. GOOD AIR THROW, AWESOME LOOK & GOOD QUALITY MATERIAL. OVERALL BEST AIR COOLER AND THANKS TO INFIBEAM FOR THEIR QUALITY IN PRODUCT OR DELIVERY/SHIPMENT INSTEAD OF TAKEN FEW MORE DAYS FOR DELIVERY.